* Température: température constante de 22 à 26°C (jour et nuit). * Lumière: 12 à 14 heures de lumière par jour, jamais en lumière directe du soleil, Ne pas l'exposer à la lumière 24 h par jour. *Restrictions d'expédition: Nous n'envoyons pas nos produits dans les pays suivants: Australie, Pologne, Croatie, Maurice, Réunion, Afrique du Sud, Mexique, Japon , Canada, Brésil, Suisse, et la Nouvelle-Zélande. En cas de doute, Contactez-nous s'il vous plait, et nous vous informerons si nous pourrons vous envoyer ces étonnants kits de culture! Wash your hands thoroughly and clean the outside of the grow kit with a clean, damp cloth. Remove the lid, but keep it for step 3. Fill the kit with water up to the edge of the kit (20 º C). Place the lid and let the mushroom growkit soak for 8 hours. After soaking, remove the lid of the grow kit and carefully pour off the water, until the last drop. Add warm water (20 º C) to the grow bag. Put the grow kit in the grow bag. Make sure the water does not go over the edge of the grow kit. 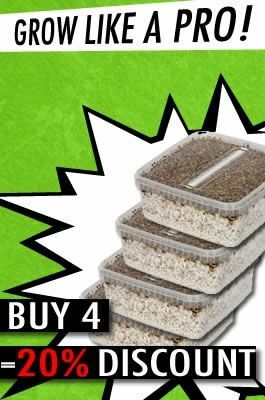 Close the growing bag by folding the top of the bag and secure it with one or two paperclips (part of the grow kit package). Put the grow kit in a place out of direct sunlight but enough daylight, and not on or near a heater or heat source. The ideal temperature is between 20 and 25 º C. Make sure there is sufficient sunlight. The first mushrooms will be visible in 10 to 12 days. The mushrooms should be harvested just before the skin underneath the hats starts to loosen up. The harvest: grab the stem gently and turn the mushroom to the left and than to the right and gently pull. This way you can remove the mushroom as complete as possible. This way you can reuse the grow kit. After harvesting, clean the surface of the grow and remove the old and dead mushrooms, so the new mushrooms have the ability to grow. Put the grow kit for the best results in the refrigerator overnight. Caution! Not colder than 2 ° C.
Start again from step 5 for the next harvest. The ideal climate is 22 º C.
Don't use a heating mat for temperatures above the 20 degrees. Try to avoid mushroom spores on the substrate, it will kill the mycelium. Quelques petites défaillance dans le produit, mais rien de bien grave.Rien à redire. 1 er commande chez avalon, un peut de retard mais les boxs sont là, à voir par la suite !! J'espère une aussi bonne qualité que les autres sites :) peace ! Traitement, envoi et qualité toujours irréprochables, kits fiables.